Hi Vivek, thanks for your time to talk to us. 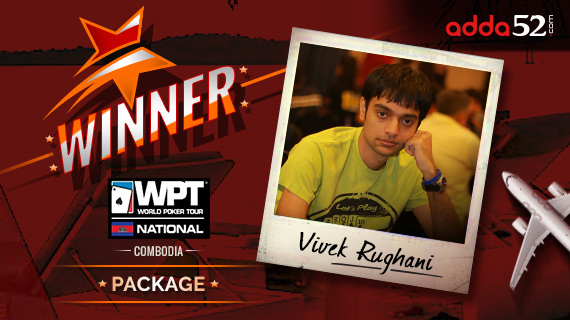 First of all, congratulations on winning the WPTN- Cambodia package. How are you feeling after winning the satellite event? I felt good as me and my group of friends had already planned a trip to Macau to play at APT. Now that Abhineet has also won a satty, and Alok came second, we will planning a trip to Cambodia as well. Q: How has been this year at the online poker felt? It has been a great all year around for me in poker. In the beginning of the year, I joined ‘India Poker Pros’ operated and managed by my good friends Anup and Abhishek. Since then, I have been grinding cash in online poker and also working on improving my game. Thanks to my poker training given by Sahil, Nitin and Abhishek as they chip in when needed. This year my MTTs has been pretty good, I have been winning events at regular levels and recently have been on a roll in winning tournaments back to back. Q:Tell us something about your experience with playing poker on Adda52.com,. For how long have you been playing on our site? I started playing on Adda52.com in December 2015, so its been almost a year now. I play more of tournaments on Adda52.com in comparison to cash games as the software doesn’t allow an easy multi-table play. Q: Is it your first international poker tour? How often do you play live poker? As I mentioned earlier, this will be my second trip. After APT Macau, I would go to WPTN Cambodia. Now I am shifting my focus to more of live poker as online is getting tougher plus the better options are available in live poker. In 2016, I have played 3 live poker series in Goa (including 2 DPTs). I also play cash games regularly in Ahmedabad. Q: Finally, what are goals for the year 2017? I have over-achieved my poker goals for 2016. I have quit my job and now taken up poker as a full time career. My poker goals for 2017 will be to improve my game, play more international events and prepare myself for WSOP 2018 or WSOP 2017 if I get a good score at APT and WPT.